Former presidential spokesman Harry Roque Jr. is withdrawing his bid for senator, he says on his Facebook page. He says he is withdrawing because of health issues. “I have recently undergone a percutaneous coronary intervention following the discovery of an unstable angina coronary disease. In the days since the pro- cedure, I have been forced to confront the reality of my physical situation and what it ultimately means for my aspirations to pub- lic service,” he says. Roque, a human rights lawyer before joining gov- ernment, had initially said he was running as a par- ty-list representative and would advocate passage of laws to protect the en- vironment. Days later, he pushed through with filing a certificate of candidacy for senator. Angara also shot up in the December survey, gaining over 21 points from 37.1% to 58.5% to put him in 3rd place. Meanwhile, Binay and Pimentel are seen to place between 5th and 7th places, with 46.7% and 45.5%, respectively. The rest of the names – those with ratings below 20% – are a mix of admin- istration and opposition bets. Leading them is former presidential aide Christopher Lawrence “Bong” Go. His rating has gone up, in close range of the Magic 12, from 5.9% in March, to 29.7% in December. In a matter of 9 months, his rating increased by nearly 24 percentage points, or grew five-fold. In December, Tañada got 5.1% (up from 3.4% in September), human rights lawyer Jose Manuel “Chel” Diokno got 3.4% (up from 1.6%), Magdalo Representa- tive Gary Alejano received 2.8% (up from 1.6%), and former solicitor general Florin Hilbay got only 0.4% (up from 0.2%). Many ex-senators are also performing well in their comeback bids: Pia Cayetano and Lito Lapid (who both placed ahead of Binay and Pimentel in the December survey), Sergio Osmeña III, Ra- mon “Bong” Revilla Jr, Jinggoy Estrada, and Ma- nuel “Mar” Roxas II. All of them have received rat- ings above 25% in the 4 Pulse Asia surveys. In the lead-up to the 2016 elections, Senators Joel Villanueva and Sherwin Gatchalian were in a similar situation: they had ratings below 10% up to the first half of 2015 in Pulse Asia surveys, but they gradually inched their way to the bot- tom of, or just outside, the Magic 12 range by the start of 2016. The initial list includ- ed those who had been named in the poll body’s law department petition to be declared nuisance can- didates for senator. The Pulse Asia survey in December, the first one af- ter the filing of Certificates of Candidacy (COCs) in October, showed that some bets are already in the lead, others are gaining ground, while the rest still have to catch up if they want to be in the winning circle. LP. The performance of the opposition Liberal Party’s 8 Senate bets has not been aus- picious so far. Only Roxas has consistently placed in the “Magic 12” while Aqui- no had just returned to that range. Consistently landing in the top are 5 of the 7 ree- lectionist senators: Grace Poe, Cynthia Villar, Juan Edgardo “Sonny” An- gara, Nancy Binay, and Aquilino “Koko” Pimen- tel III. the Magic 12 in the surveys, returning to the 10th-16th range in December, after dropping to the 18th-23rd spot and suffering a 12-point decrease from June to Sep- tember. Poe has so far pulled away from everyone else in all surveys, but Vil- lar seems to be gaining steam. Villar breached the 60% mark in the Decem- ber 2018 survey when she garnered 66.6%, up by nearly 9 percentage points from September. Among those in the Magic 12 in the December survey, Angara, Lapid, Pimentel, Aquino, and Revilla got the biggest jumps from Septem- ber, while only Binay suf- fered a drop in rating. The rest of the LP slate has not yet broken the 10% bar- rier. Their ratings in Decem- ber have moved up by only a bit – getting almost the same scores as in their first Pulse Asia survey debuts. The big- gest gainer among them was former Quezon representa- tive Lorenzo “Erin” Tañada III, who improved by 3.4 percentage points from March. ￼￼Two new names in the Senate race are joining the strong performers: Il- ocos Norte Governor Ma- ria Imelda “Imee” Mar- cos, and former Bureau of Corrections director gen- eral and former Philip- pine National Police chief Ronald “Bato” dela Rosa. Hugpong. Most of the candidates endorsed by the Hugpong ng Pagbabago (HNP) party of presidential daughter Sara Duterte Car- pio are also doing well. Six of the 8 members of HNP’s slate with ally po- litical parties nationwide are within the “Magic 12”: Vil- lar, Cayetano, Marcos, Es- trada, Dela Rosa, and Ejer- cito. The other two are Go and Mangudadatu. Two other aspirants had preference ratings above 10%: former presidential po- litical adviser Francis Tolen- tino (at 19.4%), and former senator Juan Ponce Enrile (at 19%), who appeared in the survey for the first time, after the surprise filing of his candidacy for senator. Election lawyer Romulo Macalintal, who made his first appearance in the Sep- tember survey with 1.3%, improved to 2.1% the fol- lowing quarter. Marawi civic leader Samira Gutoc Tomawis, listed for the first time in December, received 1.3%. nary list of aspirants for the 2019 midterm elec- tions for possible correc- tion of names. have started making the rounds on social media and on the ground already, in the hopes of catching vot- ers’ attention early on. voting for him or her), Pulse Asia projected the range of the senatoria- bles’ ranking among all the bets, as a preview of the place or rank they will most likely land on after actual votes are counted in the May elections. bers, only Pimentel and Dela Rosa have placed in the “Magic 12” so far, while Maguindanao Congressman Zajid “Toto” Mangudadatu received only 5.5% in De- cember, up from 2.2% in September. Among the 6 bets who are in HNP’s longer slate for Davao region (besides the 8 in the nationwide slate), only Angara, Pimentel, and Re- villa are in the “Magic 12” so far. The rest have yet to make it: Tolentino, former presidential spokesperson Harry Roque, and reporter Jiggy Manicad. As at January 2019, NARRA Co-op is the proud owner of Shop 2, Artisan Apartments 3-9 Warby St, Campbelltown. This is in addition to our first property Shop 4, which was bought two years ago. ACI Central - Home of Philippine Arts, Culture and Innovation in Australia. Just a simple letter from the Department of Fair Trading in response to Jhun Salazar’s letter of complaint as regards his ill-boding, inauspicious, and sinister dislodgement as Public Officer , but when you break it down to the basic premise/proposition, argumentation, and conclusion -- there ‘s more than meets the eye. In effect, we are faced exactly with the very root as well as the bare realities underpinning the two-in-one APCO problem that has been pestering the Filo commune in NSW for two years now. • All of the parties are encouraged to make every endeavour to resolve the internal dispute as soon as possible. We can assume, rather explicitly or implicitly, that it should not be logically difficult to support the plain and simple conclusion that all parties (MUST) endeavour to resolve the situation of conflict or internal dispute. When all is said and done, one thing is loud and clear. The problem of APCO is not within the province or jurisdiction of Department of Fair Trading, nor is it their responsibility to interfere in internal dispute. .
Where does this bring us? Back to the drawing board. I take liberties to shift to our lingua franca .Mas mainam kasi kungTatagalugin na lang natin para mas higit na maunawaan at maliwanagan ng higit na nakararami. Una, balikan natin ang tatlong bagay na hinimay ko sa simula’t sapul na napakasimple at diretsahang sinagot ni Ms. Matheson. Kung tutuusin maliit na organisasyon lang naman talaga ang APCO kahima’t maraming iba pang samahang napapailalim dito. Kaso ang problema ang lalaki ng mga “EGO” ng mga taong nasasangkot sa mga usapin.Lahat may ambisyon. Bawat isa may kani-kaniyang ipinagpupumilit o ipinaglalabang prinsipyo kuno. Ang tunay na nangyari sa APCO ay ang pagkabuwag ng pananalig at pananampalataya ng mga dati-rating sunud-sunurang miembro sa mga opisyales na naghari-harian. Ang resulta nahati ang grupo at nagkampi-kampihan. Hindi na bago ito sa ating mga Pilipino. Ugali na natin ito. Ang pagkakabuwag ng mga partido, pag-aaway-away ng mga kampo ng maka- Kaliwa o ng maka-Kanan (halimbawa sa Pilipinas ngayon, ang hidwaan ng mga Dutertards/DDS laban sa mga Dilawan) ay ordinaryong kalakaran na sa politika. Bahagi na ito ng ating kasaysayan, ng ating pinagmulan at kinamulatan kaya paulit-ulit na nangyayari sa iba’t ibang panahon. Sa kaso ng APCO, lumalim at lumala ang di-pagkakaunawaan nang pinangatawananan ng bawat grupo ang kanilang paninindigan. Umabot na sa puntong ang mga miyembro at opisyales mismo ng APCO ay di na magkasundu-sundo dahil nag-uumpugan ang mga EGO. Eto ngayon ang tanong? Posible ba na magsipagbaba sa kanilang trono ang mga nagsasalpukang opisyal dahil iisa lang naman ang pinagmulan ng iisang bunga? Matay ko mang isipin, pwedeng-pwede kung maghaharap muli ang dalawang grupo at magkakasundong mamili at maghalal ng mga bagong opisyal. Balik-tanawin natin ang pinagmulan ng UNIFICATION MOVEMENT na pinasimulan ng pahayagang ito sa pamumuno ng Tagapaglimbag. Patapus na halos ang dalawang taon ng bawat kampo. Nairaos din ang kanilang termino kahit nauwi sa malawakang bangayan. Tuloy naisantabi ang mga tunay na simulain at nakaligtaan ang mga proyektong pinaka – raison de etre (reason for being) ng organisasyon. Ang dapat pagkasunduan ng dalawang kampo ay ito. Kailangang magtakda ng isang araw para sa UNIFICATION at RECONCILIATION kung saan nagkakaisa ang lahat na magsimulang muli – isantabi ang mga di pagkakaunawaan at magkasundong magbuo ng BAGONG PINAGTIBAY na APCO sa pamamahala ng mga bago ring liderato. Para sa akin, kalokohan ang magtumbang preso pa kayo sa Korte Suprema, gaya ng isinasaad sa sulat ng Fair Trading. Wala naman kayong mapapala. Wala rin kayong mapapatunayan. Ending, bale minasahe nyo lang ang inyong mga ego na naman. At what cost? Sa madali’t sabi, iminumungkahi kong magsimula sa zero, parang tabula rasa o yung tinatawag na CLEAN SLATE dapat. Clean slate begins with the common decision and agreed action of wiping the slate clean. It’s like starting anew, a fresh approach. But the only way to do achieve this is to get rid of the old directors. Anybody who has been elected to the Board for more than two years should give a chance to those who have never served before. What I believe that can be done is to form a Council of Elders – composed of those who began APCO, all the past Presidents and Vice Presidents and other outstanding past officers and Board of Directors. That way there can be no place `for DICTATORSHIP. The Council of Elders are supposed to be respected and honoured for their experiential knowledge of the organization not to mention their actual work and life experiences. Factor in their spirituality, teachings, wisdom, and high intelligence --Elders have a deep understanding of people and communities. They are recognized for their gifts, special abilities and distinguished work that make them role models, resource persons, and advisors providing guidance and support to everyone. Specifically, they shall work in partnership with the various Standing Committees by providing guidance, support, plus sharing of traditional knowledge of wisdom, beliefs and values in a caring and respectful way. Whenever consulted, the Council of Elders will be actively involved in decisions respecting the direction and governance of the organization. What is more and very promising indeed, is that Constitutional Amendment is in the offing, and should by all means be the order of the day. This is the best opportunity whereby sufficient safeguards can be put in place to ensure an appropriate level of governance and financial responsibility. To this end, and mindful of the lessons learned from the first-hand experience of a disintegrating organization, I am the first to suggest a structural change in the organization by demolishing the Board of Directors and creating instead a more streamlined yet very strong and encompassing STANDING COMMITTEES with a Chair and Vice –Chair. • ETHICS COMMITTEE need be instituted in place of the age-old and ineffectual GRIEVANCE COMMITTEE so that any and all matters relating to the conduct, rights, privileges, safety, dignity, integrity and reputation of APCO and its members shall significantly fall under this all-important Committee. Inevitably, this committee should encroach on and include Accountability of Officers and Proper Conduct of Investigations of any matter of public interest on its own initiative or brought to its attention by any member of APCO. Thus every APCO member is intrinsically tasked to report alleged wrongdoings of its officials and its attached agencies, including the management, control, and use of its owned equipment and facilities if any. B.) COMMITTEE ON PEACE/UNIFICATION/RECONCILIATION shall handle all matters relating to peace, internal conflict resolution, political negotiation, cessation of hostilities, including integration and development thru national unification and reconciliation with other Filipino-Australian organizations. -- The preservation, enrichment and evolution of Filipino-Australian ARTS and CULTURE. Finally my one last statement about what happened to APCO is akin to a death by a thousand cuts. This is a figure of speech that refers to a failure that occurs as a result of many small problems. Death by a thousand cuts could refer to the split within an organization such as APCO as a result of a tangle of individual egos concretised in the battle between two ladies each claiming to be rightful President. To paraphrase Hamlet, the failure to come to terms or to reach mutual agreement, that is the question! Both parties failed to begin to or make an effort to understand, accept, and deal with a difficult or problematic person, thing, or situation. As such, the problem blew up to uncontrollable proportions and resulted in spewing several small issues rather than one major one. Perhaps readers will understand the phrase better and my application of it in the case of APCO, when you consider the term was originally used to describe an ancient form of torture wherein the condemned person was subjected to a number of minor wounds until the accumulation of damage became fatal. This hyperbole, so to speak, refers to the idea that while a single small cut may not be all that fatal but the total cumulative effect may eventually cause a person to bleed to death. This is what I’m afraid may happen to APCO eventually. Hindi naman kasi ang mga taong napakatataas ng lipad, bilib na bilib sa sarili, at pagkalalaki ng mga ego (mas malaki pa sa organisasyon) ang sadyang nasasakal at unti-unting kinikitil ng walang pinatutunguhang pag-aaway ng dalawang kampo kundi ang APCO mismo. The response of Fair Trading to the two warring camps in APCO is loud and clear: that it is none of their business to interfere in an intrinsically internal dispute that must be resolved following the constitutional provisions by the parties involved if not raised to the level of the Supreme Court. Jodie Matheson, Team Manager, Case Management of the Department of Fair Trading wrote more explicitly of Fair Tradings’ non-involvement in matters not within their domain. 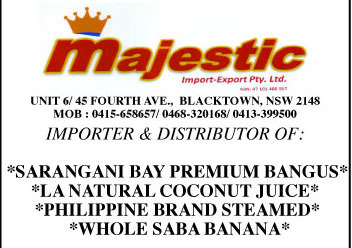 “The Association is registered under the Associations Incorporation Act 2009, which is administered by NSW Fair Trading. The Act is designed to find a balance between freedom and flexibility for associations to establish themselves and to operate while ensuring there are sufficient safeguards in place to ensure an appropriate level of governance and financial responsibility. It follows that the legislation does not provide the Registry with the authority to intervene in matters relating to the internal administration of an association. For your information I have attached information on Fair Trading’s powers to enquire and investigate and areas for which Fair Trading does not have responsibilities. The committee is charged with the responsibility of ensuring the association is operating in accordance with the legislation generally and the association’s constitution specifically. Fair Trading has no jurisdiction to determine the facts at the base of an internal dispute or an alleged breach of an association’s constitution, the only body with this jurisdiction is the Supreme Court of New South Wales. “In such cases, until Fair Trading has evidence of either an agreement or an order by the Court determining the matter the Association may be noted as being ‘in dispute’ on the Register of Incorporated Associations. In these circumstances Fair Trading will inform all parties to the dispute that no documents will be accepted for lodgement on behalf of the association. The internal dispute within APCO grounds began when the appointed and not duly elected President Violetta Escultura was removed from her post following a vote of no confidence from the Board and general membership. Trouble further ensued when the Escultura camp was quick enough to lodge their own documents to the Department of Fair Trading. They submitted a list of new Elected Board of Officers and even replaced the Public Officer to one of their own. The documentation Escultura’s group received from Fair Trading effectively gave them further access to withdraw 12 thousand of APCO funds reportedly deposited in a new account for safeguarding. Cora Paras’ camp which, from all legal indications and implications, appear to be the real legitimate APCO Board, did not take the Escultura group’s legerdemain sitting down. Complaint/protest letters were filed to both the Fair Trading and Commonwealth Bank where proper investigations are ongoing. Meanwhile, the final resolution to the seemingly never ending conflict has been offered by Fair Trading to let the Supreme Court rule over matters that cannot be resolved internally and amicably between the two-in-one APCO. Needless to say, there are costs involved for lawyers’ fees and all other expenses. The big asks remain: Who shall make the first move? When and where will all these end?